Crazy Creatures are proud to announce that we are specialising in some very exciting new concepts with our specialist field of ‘Creature Comfort’ for SEN, Autism, Vision/hearing impairments, disability charities, mental health and rehabilitation. Ian is qualifying in Animal Assisted Therapy and has been working in these environments over the past 8 years, and has extensive experience and a fantastic way with both children and adults to put them at ease and offer unique, calm, sensory experiences to those who may otherwise miss the chance to get up close and benefit from these incredible animals. We have been proud to work in the past alongside NHS, councils, SEN charities, youth centres/day centres, children’s homes, therapists, rehab centres, Julia’s House, Naomi hospice, SEN schools and many more. 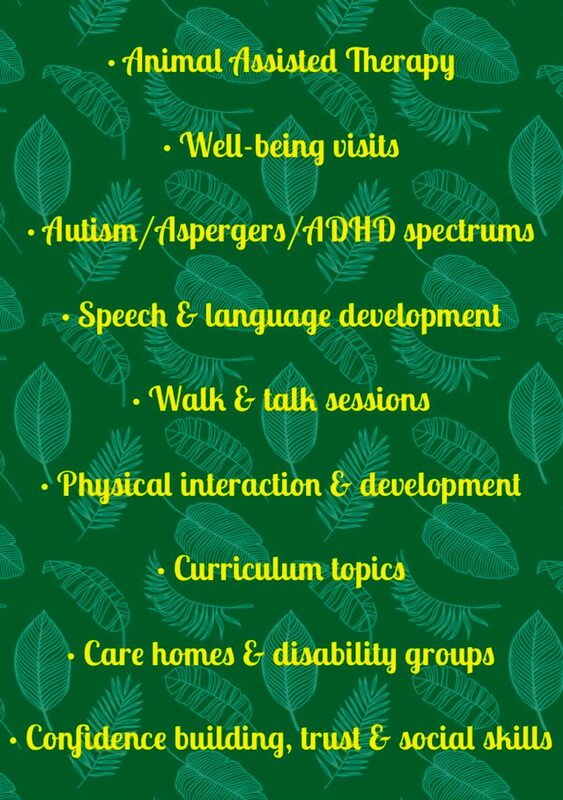 We can offer new specific tailored sessions and special offers, for both individual parents/carers (VIP visits for Autistic and SEN children/adults) up to large schools/charities/groups (all disabilities catered for, and mobile visits fully accessible). We are also happy to work alongside counsellors and therapists. We are pleased to include 30 minute FREE Creature Comfort session for 1:1/SEN children in schools in addition to any class booking.